Not to be confused with Lefty Grove. Vernon Louis "Lefty" Gomez (November 26, 1908 – February 17, 1989) was an American professional baseball player. A left-handed pitcher, Gomez played in Major League Baseball (MLB) between 1930 and 1943 for the New York Yankees and the Washington Senators. 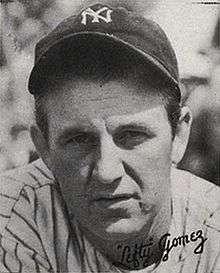 Gomez was a five-time World Series champion with the Yankees. He was also known for his colorful personality and humor throughout his career and life. Gomez grew up in California and played for the San Francisco Seals after high school. He made his MLB debut with the Yankees in April 1930. He was selected as an All-Star every year between 1933 and 1939. He sustained an arm injury in 1940. Though he rebounded well in 1941, he pitched his last full season in 1942, then appeared in one game in 1943 before retiring with the Washington Senators. In 1933, Gomez married June O'Dea, who had a brief career as a Broadway actress. After his retirement, he became a popular public speaker. Gomez was elected to the National Baseball Hall of Fame by the Veterans Committee in 1972. He made an appearance at Yankee Stadium in 1987, when he and Whitey Ford were honored with plaques at the stadium's Monument Park. He died in California in 1989. Gomez was born in Rodeo, California. His father, Francisco Gomez, had been born in California to a Spanish father, Juan Gomez, and a Portuguese mother, Rita. His mother, Lizzie Herring, was an American of Welsh-Irish descent. He played sandlot baseball in Oakland while attending Richmond High School and was recruited by the San Francisco Seals. The New York Yankees purchased Gomez from the Seals for an estimated $39,000. Gomez made his major league debut on April 29, 1930. He pitched in only 15 games and finished the season with a 2-5 win-loss record, a 5.55 earned run average (ERA). Coming into the 1931 season, Gomez had good pitching velocity, but the Yankees were concerned about the pitcher's slender frame of 6 feet 2 inches (1.88 m) and 155 pounds (70 kg). Following a common medical strategy of the time, the team had most of his teeth extracted; they also had him drink three quarts of milk daily and gave him an unlimited meal allowance for road games. Gomez registered the second-best ERA in the American League in 1931. A 20-game winner four times and an All-Star every year from 1933 to 1939, Gomez led the league twice each in wins, winning percentage and ERA; he was a three-time league leader in shutouts and strikeouts. In the first major league All-Star Game (July 6, 1933), Gomez was the winning pitcher for the American League (AL) and drove in the first run of the game. This was out of character for him; he was notorious for poor hitting even by AL standards. Late in life, Gomez commented, "I never even broke a bat until last year when I was backing out of the garage." His career OPS+ of -7 is the fifth-worst in baseball history among players with at least 1,000 plate appearances. Gomez holds the record for the most innings pitched in a single All-Star game (six, in 1934). Lefty's best season came in 1934, when he won 26 games and lost just five. In both 1934 and 1937, he won pitching's "Triple Crown" by leading the league in wins, ERA and strikeouts; he also led the AL both seasons in shutouts. His .649 career winning percentage ranks 15th in major league history among pitchers with 200 or more decisions. 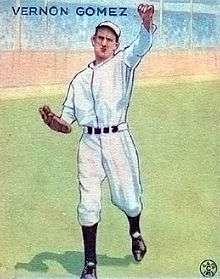 Among pitchers who made their MLB debuts from 1900 to 1950, only Lefty Grove, Christy Mathewson and Whitey Ford have both more victories and a higher winning percentage than Gomez. Nicknamed "El Goofo" and "Goofy Gomez", he was known for his sense of humor, even on the field. In one game, he came up to bat when it was slightly foggy. Bob Feller was on the mound and Gomez struck a match before stepping into the batter's box. "What's the big idea?" asked the umpire. "Do you think that match will help you see Feller's fast one?" Gomez replied, "No, I'm not concerned about that. I just want to make sure he can see me!" Another time, a reporter asked the noted brushback pitcher, "Is it true that you'd throw at your own mother?" Gomez replied, "You're damn right I would. She's a good hitter." Gomez also often remarked, "I'd rather be lucky than good." In 1940, Gomez suffered an arm injury, which left him up for grabs by another team, but in 1941 he played fairly well, winning 15 and losing 5. During that season, he was said to be a great starting pitcher, but won through the support of Johnny Murphy, who relieved him in later innings. After the 1942 season ended, Gomez took a job as a dispatcher with the General Electric River Works, a defense plant in Lynn, Massachusetts, which only paid $40 a week. Then on January 27, 1943, the Yankees sold him to the Boston Braves for $10,000. Gomez never appeared in a game with the Braves, as later in the year he was released from his contract and signed with the Washington Senators. He pitched just one game ― on May 30, 1943, allowing four hits, four runs and walking five men ― before pulling a shoulder muscle in the fifth inning and retiring from baseball. He had a 189–102 career record with 1,468 strikeouts and a 3.34 ERA in 2503 innings pitched. On February 26, 1933, Gomez married June O’Dea (1912–1992). A Broadway headliner who starred in Of Thee I Sing, she gave up her career in 1936. By 1937 the marriage was on shaky ground. Gomez traveled to Hollywood that April and June returned to Massachusetts to stay with family. Through the tabloids, she learned in December that Gomez was filing divorce papers in Mexico, charging incompatibility. Being a devout Catholic, June refused a divorce but agreed to a formal separation, citing abandonment and cruel and inhuman treatment. Publicly, Gomez said the whole idea of divorce was absurd, but after the first of the year he moved to Reno to get a six-week divorce. It was his intention for the divorce to be finalized by the time he began spring training in Florida. Separation proceedings continued for months, but were called off in May 1938. Gomez and O'Dea had two daughters and two sons. In retirement, Gomez became a sought-after dinner speaker known for his humorous anecdotes about his playing days and the personalities he knew. He was a bit of a screwball, nicknamed "El Goofo" or "Goofy Gomez" (a likewise-alliterative counterpart to his contemporary, Dizzy Dean), and delighted in playing practical jokes on everyone from teammates to umpires. On February 2, 1972, the Veterans Committee unanimously inducted Gomez into the National Baseball Hall of Fame, along with Giants outfielder Ross Youngs and former American League President Will Harridge. The Committee noted that Lefty pitched in seven World Series games with no losses and five wins. Wearing a Yankee cap, Gomez became the second player of Hispanic descent to be inducted. The 1983 Major League Baseball All-Star Game was dedicated to Gomez as he was the last surviving player from the 1933 All-Star Game. He also threw out the ceremonial first pitch. On August 2, 1987, he and Whitey Ford were honored with plaques to be placed in Monument Park at Yankee Stadium. Gomez's plaque says he was "Noted for his wit and his fastball, as he was fast with a quip and a pitch." Despite advancing age, he was able to attend the ceremony. Although he was honored with the plaque, his uniform #11 has not been retired, and has since been worn by several Yankees including Joe Page, Johnny Sain, Héctor López, Fred Stanley, Dwight Gooden, Chuck Knoblauch, Gary Sheffield, Doug Mientkiewicz, and Brett Gardner. Gomez spent the last years of his life in Novato, California, and he died of congestive heart failure on February 17, 1989, in Marin General Hospital in Larkspur, California. A decade later, he was ranked #73 on The Sporting News list of the 100 Greatest Baseball Players, and was a nominee for the Major League Baseball All-Century Team. 1 2 Gomez, Vernona; Goldstone, Lawrence (2012). Lefty: An American Odyssey. New York: Ballantine. ISBN 9780345526489. ↑ "Lloyd J. Gomez Obituary". Oakland Tribune. Oakland, California. January 20, 1960. p. 29. 1 2 Fraley, Oscar (January 27, 1943). "Yanks Sell Lefty Gomez to Bees; Price is $10,000". The Modesto Bee. Modesto, California. p. 8. 1 2 "Lefty Gomez Quotes". Baseball Almanac. Retrieved August 5, 2013. ↑ "Lefty Gomez". Baseball-Reference.c0m. Retrieved 23 January 2013. ↑ "Oct 6, 1937, Giants at Yankees Play by Play and Box Score". baseball-reference.com. ↑ "Gomez wife to fight divorce suit". The Lowell Sun. Lowell, Massachusetts. December 27, 1937. ↑ "California Death Records". Ancestry.com; Search under "Eilean Frances Gomez"
↑ "To Fight Divorce". The Lowell Sun (301). Lowell, Massachusetts. December 28, 1938. ↑ "Gomez Would Speed Divorce Plans". The Lowell Sun. Lowell, Massachusetts. January 3, 1938. p. 10. ↑ "Lefty and Wife Call Off Suit". Nevada State Journal. LXVII (182). Reno, Nevada. May 9, 1928. 1 2 Durso, Joseph (February 18, 1989). "Vernon (Lefty) Gomez, 80, Dies; Starred as a Pitcher for the Yankees". New York Times. ↑ "Baseball's 100 Greatest Players". Baseball-Almanac.com.